YES! Because: "hours of scales"
are NOT enough, [by themselves]! I first encountered THE COWLING SYSTEM© through an ad in a musicians' magazine, which promised that by using it, a musician's technique, power and speed would increase significantly. I was intrigued. So I purchased the materials, did the exercises and, in fact, did get the exact result which the System promised! Now - WHY did these exercises work so well? Why so "deadly effective" in fact? How could a mere FEW SECONDS each of full contraction of the fingers in certain positions produce nearly "explosive" strength and dexterity and velocity increases?? Well, there are several principles at work here - and it's fascinating that the "isometric" aspect of physical exercise is brilliantly employed in "The Cowling System" - about a CENTURY before this principle even had a name! "One of the main benefits of isometric training is that the body is able to activate nearly all the available motor units - something that is usually very difficult to do. "Back in the 1950s, researchers Hettinger and Muller found a single daily effort of two-thirds of a person’s maximum effort exerted for six seconds at a time for ten weeks increased strength about 5% per week, while Clark and associates demonstrated static strength continued to increase even after the conclusion of a five-week program of isometric exercises." Yes - it IS real science! See this page for more references. Personally, using the Cowling System of hand strengthening exercises, I felt a good deal more progress in my musical ability than just "5% per week". But even that is nothing to look down on when you add up the eleven or so weeks for the whole program - I'd take it! Well -- Much later on, seeing that my original materials needed to be replaced, I searched all everywhere for any current publications of this work, and I ultimately discovered that the Cowling Institute and the Cowling System were no longer in existence! This seemed a mystery to me, as I and many others had obtained excellent, even remarkable, results with it. So, in further research, I found that this system originally appeared in the early 1900's, as a full page ad for the Cowling System in a musicians' magazine in December of 1914, complete with glowing testimonials, shows. So, I then proceed to restore my only copy of these fading materials to their former glory and beyond. I still employ these hand strengthening exercises to very beneficial effect, and so do many others. I trust that they will do the same for you. Basics of the Cowling System: Playing an instrument is an ATHLETIC activity. 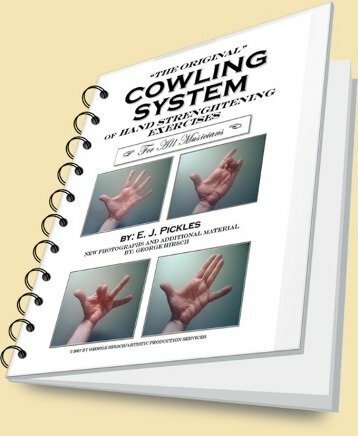 For the digital version of "THE ORIGINAL" COWLING SYSTEM © of hand strengthening exercises, with FULL COLOR photos, for the reduced price of $22.50 - just click below.